Sixth-century Ireland finds Christians and Druids wary of each other, especially when bodies start piling up in the bogs. Philip Freeman, a professor of classics at Luther College and author of several nonfiction books on classical-era history and mythology, follows up his 2014 novel St. Brigid’s Bones with a second mystery featuring intrepid sixth-century Irish nun Sister Dierdre. 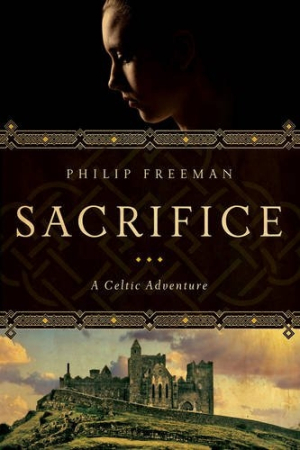 Like its predecessor, Sacrifice takes place at a time when Christians and Druids uneasily coexist while contending for Ireland’s soul. Dierdre, who was tutored by her family in the mysteries of the Druidic tradition before she joined the order of St. Brigid, is in a unique position to understand and relate to both spiritual worlds. She needs every bit of that understanding when one of the sisters of her convent is found dead, strangled and placed in a bog in a fashion reminiscent of an ancient pagan sacrifice. The stakes rise when another nun is slain, and then another, in ways that suggest a continuing series of sacrifices to the pre-Christian gods of Ireland. Others, including the aristocratic relatives of the slain nuns, do not share Dierdre’s tolerant views, and open religious warfare may result if she cannot find and stop the killer. Dierdre is a strong female character whose acceptance of various religious traditions and a tolerant attitude toward the earthier sides of life offer the modern reader a sympathetic viewpoint. Other characters in this relatively short, fast-moving tale are necessarily portrayed in less detail. The kings, druids, and warriors with whom she interacts are usually experienced through their words and actions, which fit right into the historical scenario of perpetually feuding petty kingdoms. With a few exceptions, the nuns of the order of St. Brigid are less fortunate, sometimes receiving only a short introduction before being found dead, killed in some grisly fashion. Anyone else interested in mysteries set in the misty world of early medieval Ireland will find Sacrifice, like St. Brigid’s Bones, an intriguing and exciting tale.